What's soft, squeezable and covered head-to-toe in long shaggy plush fur? August the Fuzzy Folk Wolf Stuffed Animal by Fiesta. 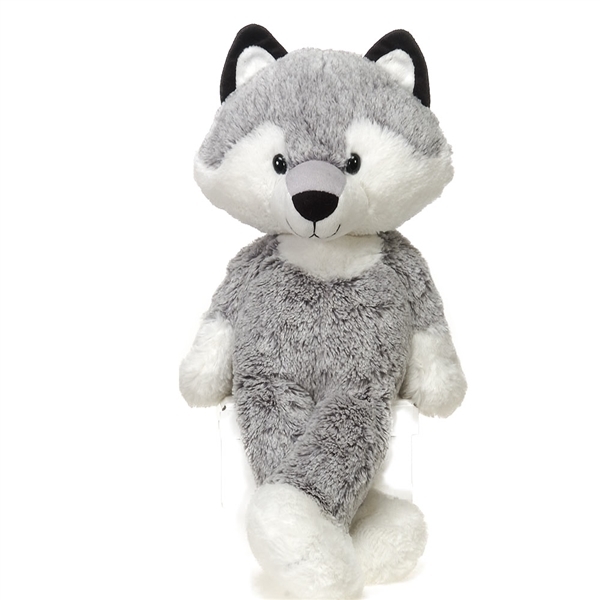 Measuring at sixteen inches, this fuzzy stuffed wolf is the perfect size to wrap in a big 'ol hug. Its bean-weighted arms and legs give this fuzzy wolf stuffed animal a unique variation on the classic stuffed animal design. With a large round head, and long floppy limbs, this fuzzy stuffed wolf is perfect to play with or to cuddle up next to on the couch. Sewn with longer plush fur for extra softness, August the Fuzzy Folk Wolf Stuffed Animal by Fiesta is the kind of stuffed animal you'll want to keep close. Want to make some lasting memories for the young person in your life? The fun and fluffiness will be in no short supply with this fuzzy stuffed wolf. And the fun doesn't end there! There's an entire line of Fuzzy Folk stuffed animals by Fiesta. Be sure to check them out! For over 40 years, Fiesta Toy has been one of the world leaders and innovators in stuffed animals and plush toys. Their wide assortment of traditional and unique stuffed animals inspires creativity and imaginative play. Fantastic products like this fuzzy stuffed wolf allow children to share in the magic of the animal kingdom and learn more about the fascinating creatures that inhabit and share our planet. August the Fuzzy Folk Wolf Stuffed Animal by Fiesta is made with all new, child safe materials and meets or exceeds all U.S. safety standards. Recommended for ages three and up, we suggest surface washing for this fuzzy wolf stuffed animal.